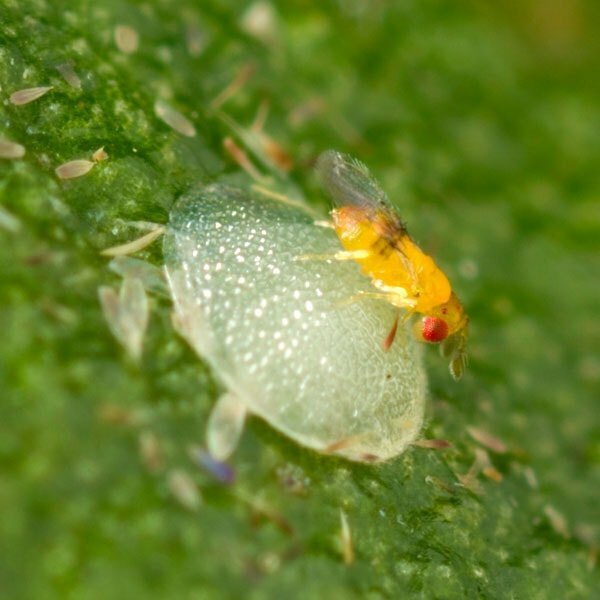 This tiny parasitic wasp is an effective biological control agent because it kills its host before a plant can be damaged. Despite its miniscule size — 1mm or less — Trichogramma pretiosum is an efficient killer of some 200 undesirable insects. It uses smell to determine the suitability of a host for deposit of its egg. Wasps emerging from a destroyed egg note its smell and use it to find another suitable host. 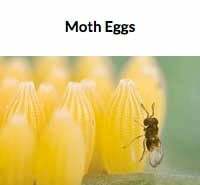 Harmful insects it predates include armyworm, bagworm, European corn borer, peach borer, squash borer, cankerworm, alfalfa caterpillar, cutworm, corn earworm, wax moth, tomato hornworm, cabbage looper and codling moth. 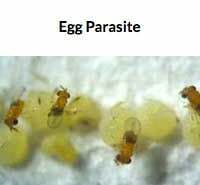 The parasitic wasp inserts its eggs inside the eggs of these pests, killing them before they enter the plant-consuming larval stage. 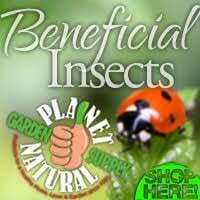 Shop our large selection of beneficial insects, including moth egg parasites, at Planet Natural. One small bag — 3 squares — treats 15,000 square feet and costs $12.95 with USPS First-Class Mail shipping included! The female trichogramma is prolific during a lifespan that is less than two weeks. 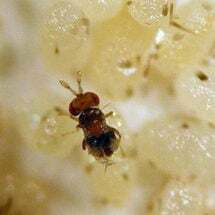 She injects a single egg into the eggs of the pest. After consuming the contents of its host egg, a new adult emerges within a week. 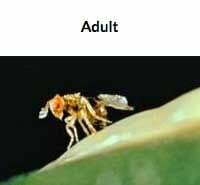 Because of this quick turnover, trichogramma wasps multiply rapidly given the right conditions. During her 9-11 day life, the female wasp will seek out and destroy about 100 pest eggs by laying an egg inside of it. As the tiny parasites develop inside they consume the contents. Depending upon climatic conditions a new adult will emerge in about a week. The emerging adults are overwhelmingly female, few are male. This and the short life cycle allows the wasp’s population to quickly reach effective numbers in relation to the target pest. Shipped as pupae in host eggs, glued to one inch by one inch paper squares, T. pretiosum arrive ready to hatch out as adult wasps. Release when moths are first present and periodically thereafter. Use 5,000 parasites (1 square) per 5,000 square feet weekly, or every other week for 3 to 6 consecutive weeks. Tip: Ants can be a problem eating the eggs on the squares if found. However, placing them in strategic areas should prevent this. Hanging each square from a piece of thread is a solution.